Another day to hit the pond, but more rain means that driving to the pond is not an option. Hiking will get the rods to a place to cast flies so I grab a 1 weight and a bamboo rod, the fish basket, and many more flies than will be needed; but don't we all take to many flies? I arrived at the pond which lies east-west with the dam at the west end. There is a fairly steep hill on the north side of this pond. To stop erosion, tree have been planted along this whole thing so there is not any room to fly cast there. However, there is plenty of room to cast around most of the rest of the pond. There is one large oak that moves around to catch flies, and I've had lots of personal experience with that. I headed to the west end of the pond to be fishing back toward the truck. Went with a white Only and a mini leech. This is the version of the mini leech that has worked for me. Pattern is: scud hook with bead head, red tinsel tag, Pine squirrel strip (about 1 inch) and ice dubbing for head. Pine squirrel has worked better than the rabbit strips that I also tried. I cast the mini leech first and let it drop a few seconds and started to retrieve it in. I had moved it a few times and then the rod tip was down and the line going to the side. I guess there is a fish on the line. This fish had ideas of not coming to the shoreline. It was a nice gill that finally came to hand. I cast again and had a nice crappie take the fly. I got to see the swirl as the fish took the fly, and then no more interest. I tried the Only and got another gill to take it. After a few more casts it was time to move. At the next spot as soon as the fly hit the water there was a swirl. Another nice crappie came to hand. Letting the fly drop a little deeper produced a few more bluegill. I tried the Only and got a few more fish. I moved again and had the same sort of thing happen. 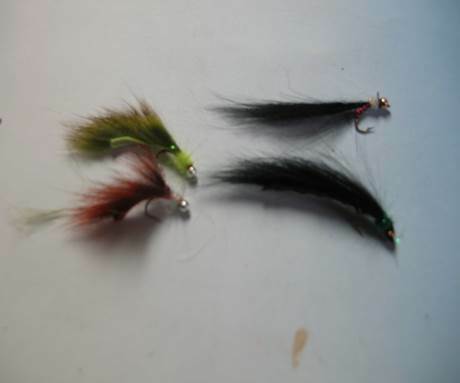 A few fish on each fly at different depths. The next move was to the south side of the pond. The water there is about 3 to four feet deep out about 20 feet. Then it slopes down to the deepest water in the pond. I cast the flies out and find there are a few fish along the break line. The flies have to almost not be moving, but I did pick a few more fish up along this area. I moved up the pond and get to the water was about four feet deep. I tred the flies and had no success so I change the mini leech to one with no bead head. This was an experiment as the fish just before had wanted a fly that was not moving much. In this shallower water the unweighted fly might work better and this worked. I cast the fly out and moved it back very slowly. The line would feel heavy more than the fish hitting, but several more fish were picked up and several of them were crappie. That was where most of the fish were caught. The thirst meter hit again and it seemed time to go. I headed home and took care of the fish. I had more fillets than I remember catching but had them to eat and share and I also had a lot of fun. As I expected I needed only a few of the flies that I took out.